For other uses, see RSS (disambiguation). For RSS feeds from Wikipedia, see Wikipedia:Syndication. The RSS formats were preceded by several attempts at web syndication that did not achieve widespread popularity. The basic idea of restructuring information about websites goes back to as early as 1995, when Ramanathan V. Guha and others in Apple Computer's Advanced Technology Group developed the Meta Content Framework. RDF Site Summary, the first version of RSS, was created by Dan Libby and Ramanathan V. Guha at Netscape. It was released in March 1999 for use on the My.Netscape.Com portal. This version became known as RSS 0.9. In July 1999, Dan Libby of Netscape produced a new version, RSS 0.91, which simplified the format by removing RDF elements and incorporating elements from Dave Winer's news syndication format. Libby also renamed the format from RDF to RSS Rich Site Summary and outlined further development of the format in a "futures document". This would be Netscape's last participation in RSS development for eight years. As RSS was being embraced by web publishers who wanted their feeds to be used on My.Netscape.Com and other early RSS portals, Netscape dropped RSS support from My.Netscape.Com in April 2001 during new owner AOL's restructuring of the company, also removing documentation and tools that supported the format. Two parties emerged to fill the void, with neither Netscape's help nor approval: The RSS-DEV Working Group and Dave Winer, whose UserLand Software had published some of the first publishing tools outside Netscape that could read and write RSS. Winer published a modified version of the RSS 0.91 specification on the UserLand website, covering how it was being used in his company's products, and claimed copyright to the document. A few months later, UserLand filed a U.S. trademark registration for RSS, but failed to respond to a USPTO trademark examiner's request and the request was rejected in December 2001. The RSS-DEV Working Group, a project whose members included Guha and representatives of O'Reilly Media and Moreover, produced RSS 1.0 in December 2000. This new version, which reclaimed the name RDF Site Summary from RSS 0.9, reintroduced support for RDF and added XML namespaces support, adopting elements from standard metadata vocabularies such as Dublin Core. In December 2000, Winer released RSS 0.92 a minor set of changes aside from the introduction of the enclosure element, which permitted audio files to be carried in RSS feeds and helped spark podcasting. He also released drafts of RSS 0.93 and RSS 0.94 that were subsequently withdrawn. Because neither Winer nor the RSS-DEV Working Group had Netscape's involvement, they could not make an official claim on the RSS name or format. This has fueled ongoing controversy[specify] in the syndication development community as to which entity was the proper publisher of RSS. One product of that contentious debate was the creation of an alternative syndication format, Atom, that began in June 2003. The Atom syndication format, whose creation was in part motivated by a desire to get a clean start free of the issues surrounding RSS, has been adopted as IETF Proposed Standard RFC 4287. In July 2003, Winer and UserLand Software assigned the copyright of the RSS 2.0 specification to Harvard's Berkman Center for Internet & Society, where he had just begun a term as a visiting fellow. At the same time, Winer launched the RSS Advisory Board with Brent Simmons and Jon Udell, a group whose purpose was to maintain and publish the specification and answer questions about the format. In September 2004, Stephen Horlander created the now ubiquitous RSS icon ( ) for use in the Mozilla Firefox browser. In December 2005, the Microsoft Internet Explorer team and Microsoft Outlook team announced on their blogs that they were adopting Firefox's RSS icon. In February 2006, Opera Software followed suit. This effectively made the orange square with white radio waves the industry standard for RSS and Atom feeds, replacing the large variety of icons and text that had been used previously to identify syndication data. In January 2006, Rogers Cadenhead relaunched the RSS Advisory Board without Dave Winer's participation, with a stated desire to continue the development of the RSS format and resolve ambiguities. In June 2007, the board revised their version of the specification to confirm that namespaces may extend core elements with namespace attributes, as Microsoft has done in Internet Explorer 7. According to their view, a difference of interpretation left publishers unsure of whether this was permitted or forbidden. When retrieved, reading software could use the XML structure to present a neat display to the end users. There are several different versions of RSS, falling into two major branches (RDF and 2.*). RSS 0.90 was the original Netscape RSS version. This RSS was called RDF Site Summary, but was based on an early working draft of the RDF standard, and was not compatible with the final RDF Recommendation. RSS 1.0 is an open format by the RSS-DEV Working Group, again standing for RDF Site Summary. RSS 1.0 is an RDF format like RSS 0.90, but not fully compatible with it, since 1.0 is based on the final RDF 1.0 Recommendation. RSS 1.1 is also an open format and is intended to update and replace RSS 1.0. The specification is an independent draft not supported or endorsed in any way by the RSS-Dev Working Group or any other organization. RSS 0.91 is the simplified RSS version released by Netscape, and also the version number of the simplified version originally championed by Dave Winer from Userland Software. The Netscape version was now called Rich Site Summary; this was no longer an RDF format, but was relatively easy to use. RSS 0.92 through 0.94 are expansions of the RSS 0.91 format, which are mostly compatible with each other and with Winer's version of RSS 0.91, but are not compatible with RSS 0.90. RSS 2.0.1 has the internal version number 2.0. RSS 2.0.1 was proclaimed to be "frozen", but still updated shortly after release without changing the version number. RSS now stood for Really Simple Syndication. The major change in this version is an explicit extension mechanism using XML namespaces. Later versions in each branch are backward-compatible with earlier versions (aside from non-conformant RDF syntax in 0.90), and both versions include properly documented extension mechanisms using XML Namespaces, either directly (in the 2. * branch) or through RDF (in the 1. * branch). Most syndication software supports both branches. "The Myth of RSS Compatibility", an article written in 2004 by RSS critic and Atom advocate Mark Pilgrim, discusses RSS version compatibility issues in more detail. The extension mechanisms make it possible for each branch to copy innovations in the other. For example, the RSS 2. * branch was the first to support enclosures, making it the current leading choice for podcasting, and as of 2005[update] is the format supported for that use by iTunes and other podcasting software; however, an enclosure extension is now available for the RSS 1. * branch, mod_enclosure. Likewise, the RSS 2. * core specification does not support providing full-text in addition to a synopsis, but the RSS 1. * markup can be (and often is) used as an extension. There are also several common outside extension packages available, e.g. one from Microsoft for use in Internet Explorer 7. The most serious compatibility problem is with HTML markup. Userland's RSS reader—generally considered as the reference implementation—did not originally filter out HTML markup from feeds. As a result, publishers began placing HTML markup into the titles and descriptions of items in their RSS feeds. This behavior has become expected of readers, to the point of becoming a de facto standard, though there is still some inconsistency in how software handles this markup, particularly in titles. The RSS 2.0 specification was later updated to include examples of entity-encoded HTML; however, all prior plain text usages remain valid. As of January 2007[update], tracking data from www.syndic8.com indicates that the three main versions of RSS in current use are 0.91, 1.0, and 2.0, constituting 13%, 17%, and 67% of worldwide RSS usage, respectively. These figures, however, do not include usage of the rival web feed format Atom. As of August 2008[update], the syndic8.com website is indexing 546,069 total feeds, of which 86,496 (16%) were some dialect of Atom and 438,102 were some dialect of RSS. The primary objective of all RSS modules is to extend the basic XML schema established for more robust syndication of content. This inherently allows for more diverse, yet standardized, transactions without modifying the core RSS specification. To accomplish this extension, a tightly controlled vocabulary (in the RSS world, "module"; in the XML world, "schema") is declared through an XML namespace to give names to concepts and relationships between those concepts. Although the number of items in an RSS channel is theoretically unlimited, some news aggregators do not support RSS files larger than 150KB. For example, applications that rely on the Common Feed List of Windows might handle such files as if they were corrupt, and not open them. Interoperability can be maximized by keeping the file size under this limit. Podcasts are distributed using RSS. To listen to a podcast, a user adds the RSS feed to their podcast client, and the client can then list available episodes and download or stream them for listening or viewing. To be included in a podcast directory the feed must for each episode provide a title, description, artwork, category, language, and explicit rating. Some BitTorrent clients support RSS. RSS feeds which provide links to .torrent files allow users to subscribe and automatically download content as soon as it is published. Some services deliver RSS to an email inbox, sending updates from user's personal selection and schedules. Conversely, some services deliver email to RSS readers. Examples of those services include Blogtrottr, IFTTT and Zapier. Both RSS and Atom are widely supported and are compatible with all major consumer feed readers. RSS gained wider use because of early feed reader support. Technically, Atom has several advantages: less restrictive licensing, IANA-registered MIME type, XML namespace, URI support, Relax NG support. The following table shows RSS elements alongside Atom elements where they are equivalent. Note: the asterisk character (*) indicates that an element must be provided (Atom elements "author" and "link" are only required under certain conditions). Several major sites such as Facebook and Twitter previously offered RSS feeds but have reduced or removed support. Additionally, widely used readers such as Shiira, FeedDemon, and Google Reader have been discontinued having cited declining popularity in RSS. RSS support was removed in OS X Mountain Lion's versions of Mail and Safari, although the features were partially restored in Safari 8. Mozilla removed RSS support from Mozilla Firefox version 64.0, joining Google Chrome and Microsoft Edge which do not include RSS support, thus leaves Internet Explorer the last major browser to include RSS support by default. ^ "The application/rss+xml Media Type". Network Working Group. May 22, 2006. Retrieved 2007-08-16. ^ Powers 2003, p. 10: "Another very common use of RDF/XML is in a version of RSS called RSS 1.0 or RDF/RSS. The meaning of the RSS abbreviation has changed over the years, but the basic premise behind it is to provide an XML-formatted feed consisting of an abstract of content and a link to a document containing the full content. When Netscape originally created the first implementation of an RSS specification, RSS stood for RDF Site Summary, and the plan was to use RDF/XML. When the company released, instead, a non-RDF XML version of the specification, RSS stood for Rich Site Summary. Recently, there has been increased activity with RSS, and two paths are emerging: one considers RSS to stand for Really Simple Syndication, a simple XML solution (promoted as RSS 2.0 by Dave Winer at Userland), and one returns RSS to its original roots of RDF Site Summary (RSS 1.0 by the RSS 1.0 Development group)." ^ a b Libby, Dan (1999-07-10). "RSS 0.91 Spec, revision 3". Netscape ttem. Archived from the original on 2000-12-04. Retrieved 2007-02-14. ^ "Web feeds | RSS | The Guardian | guardian.co.uk", The Guardian, London, 2008, webpage: GuardianUK-webfeeds. ^ Lash, Alex (1997-10-03). "W3C takes first step toward RDF spec". Archived from the original on 2011-08-09. Retrieved 2007-02-16. ^ Hines, Matt (1999-03-15). "Netscape Broadens Portal Content Strategy". Newsbytes. ^ "My Netscape Network: Quick Start". Netscape Communications. Archived from the original on 2000-12-08. Retrieved 2006-10-31. ^ RSS Advisory Board (June 7, 2007). "RSS History". Retrieved 2007-09-04. ^ "MNN Future Directions". Netscape Communications. Archived from the original on 2000-12-04. Retrieved 2006-10-31. ^ Andrew King (2003-04-13). "The Evolution of RSS". Archived from the original on 2007-01-19. Retrieved 2007-01-17. ^ Winer, Dave (2000-06-04). "RSS 0.91: Copyright and Disclaimer". UserLand Software. Archived from the original on 2006-11-10. Retrieved 2006-10-31. ^ U.S. Patent & Trademark Office. "'RSS' Trademark Latest Status Info". ^ RSS-DEV Working Group (2000-12-09). "RDF Site Summary (RSS) 1.0". Retrieved 2006-10-31. ^ Winer, Dave (2000-12-25). "RSS 0.92 Specification". UserLand Software. Archived from the original on 2011-01-31. Retrieved 2006-10-31. ^ Winer, Dave (2001-04-20). "RSS 0.93 Specification". UserLand Software. Archived from the original on 2006-11-02. Retrieved 2006-10-31. ^ Harvard Law (2007-04-14). "Top-level namespaces". Retrieved 2009-08-03. ^ Festa, Paul (2003-08-04). "Dispute exposes bitter power struggle behind Web logs". news.cnet.com. Retrieved 2008-08-06. The conflict centers on something called Really Simple Syndication (RSS), a technology widely used to syndicate blogs and other Web content. The dispute pits Harvard Law School fellow Dave Winer, the blogging pioneer who is the key gatekeeper of RSS, against advocates of a different format. ^ "Advisory Board Notes". RSS Advisory Board. 2003-07-18. Retrieved 2007-09-04. ^ "RSS 2.0 News". Dave Winer. Retrieved 2007-09-04. ^ "2004-09-26 Branch builds". Retrieved 6 October 2014. ^ "Making love to the new feed icon". Opera Desktop Team. 2006-02-16. Retrieved 2010-07-04. ^ "Namespaces in XML 1.0" (2nd ed.). W3C. August 16, 2006. ^ Holzner, Steven. "Peachpit article". Peachpit article. Retrieved 2010-12-11. ^ "Syndic8 stats table". Syndic8.com. Archived from the original on 2002-08-03. Retrieved 2011-08-12. ^ "Why Blogtrottr?". Retrieved 26 January 2017. ^ "Free realtime RSS and Atom feed to email service. Get your favourite blogs, feeds, and news delivered to your inbox". Retrieved 26 January 2017. ^ "RSS Feed Reader, your tool for saving time and money at RSS.com". Retrieved 26 January 2017. ^ Hölzle, Urs. "A second spring of cleaning". googleblog.blogspot.com. Retrieved March 14, 2013. ^ Frakes, Dan (February 19, 2012). 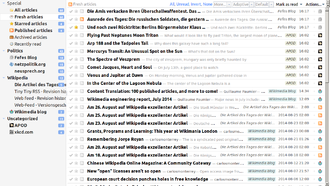 "Mountain Lion: Hands on with Mail". Macworld. Mac Publishing. Retrieved February 23, 2012. ^ "Subscribe to RSS Feeds in Safari for OS X Yosemite". OSX Daily. Retrieved January 24, 2015. ^ Cimpanu, Catalin (July 26, 2018). "Mozilla to Remove Support for Built-In Feed Reader From Firefox". BleepingComputer. Retrieved July 26, 2018. ^ "Firefox 64.0, See All New Features, Updates and Fixes". Mozilla. December 11, 2018. Retrieved December 12, 2018. Powers, Shelley (2003). Practical RDF. O'Reilly. Wikimedia Commons has media related to RSS.